During this experience, you will join Tokyo native Yukiyo in her small, cozy kitchen and learn to cook traditional Japanese tempura from scratch! Your hands-on Japanese cooking class will last about 45 minutes and you will learn to prepare tempura batter and fry vegetables like maitake mushrooms, sweet potato and the delicate shiso leaf to a perfect level of crispness. Yukiyo will also give you an understanding of which seasonal vegetables are ideal for tempura and why. Later on, you will help your host put together a beautiful bowl of chirashi (scattered) sushi - a quintessential homemade Japanese dish of fish, sushi rice and seasonal ingredients! Join Yukiyo and enjoy learning all about the tricks and techniques involved in traditional Japanese cooking before you sit down at the table to share the delicious meal you helped prepare - such a treat! Yukiyo was born and raised in Tokyo but has spent many years living in California and Taiwan. She is a fun host who enjoys learning about different cultures around the world. An interior designer by profession, Yukiyo has designed the interiors of several signature brands’ flagship stores in Tokyo. A passionate cook, she is now in the midst of learning about seasonal Japanese cuisine. Inspired by her friend who is a wine maker at Kissvin, Yukiyo has a deep interest in Californian and Japanese wine as well as sake. 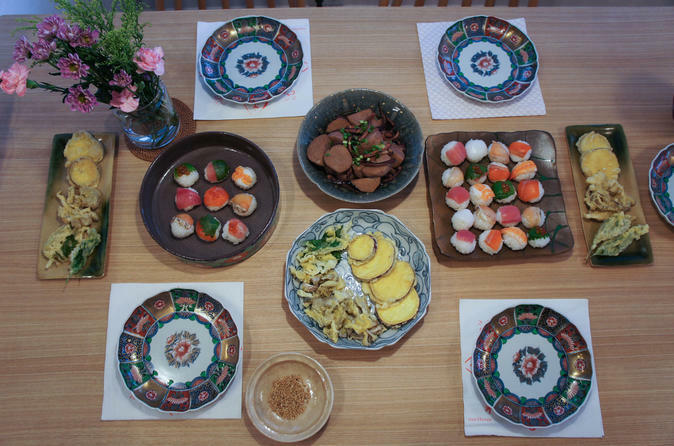 Enjoy an in-home dining experience with Yukiyo and get a glimpse of a young professional's life and cuisine in Tokyo!